The deputy, whose injuries were not life-threatening, was walking with a group of people -- including two off-duty Escondido police officers -- when they were confronted by a man with a gun at 1:17 a.m. A struggle ensued, and the deputy was shot three times in the shoulder while a bystander was shot in the arm by an apparent stray bullet. When the assailant pulled the weapon on the group, the deputy "started wrestling the suspect for the gun," San Diego police officer John Buttle told Fox 5. 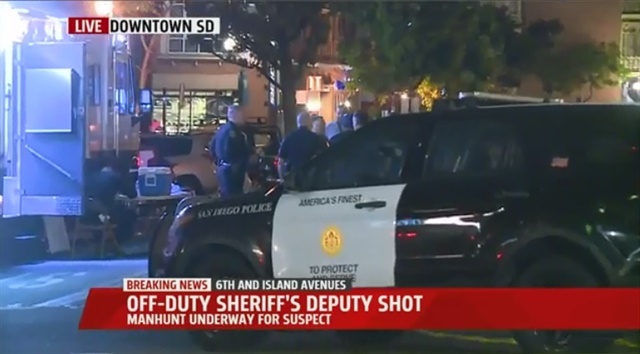 The suspect's weapon was likely a revolver and left no shell casings, San Diego police Lt. Ernesto Servin said.